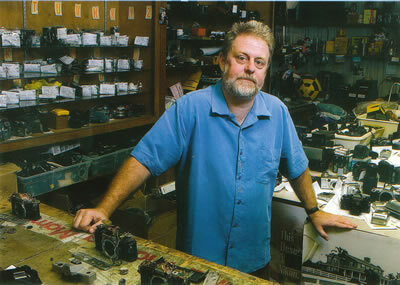 Gary Camera & Digital has operated an in-store Camera Repair Service for over thirty years! Our in-store technician continues to fix and troubleshoot problems with all 35mm and digital cameras, video camcorders, and accessories sold both today and from as far back as the 1950’s! Fill out this short online form here, print it, and sign it. Package and ship your camera with shipping of your choice at your cost to our store address provided on the form. Option A) If you approve the repair, we process a deposit on the repair for half the estimate amount over a secure phone line (Visa/MC/Discover). Option B) If you choose to reject our estimate, we cancel the repair request and charge you minimal shipping costs to return the item safely back to your address. If you approve the repair, once it is complete, we call you and process the remainder of your bill including standard shipping costs to send back your repaired item(s). For the security of your returned item, we always ship with tracking, signature confirmation, and insurance. The following policies are the way our Camera Repair Service operates strictly with non-walk-in customers. For local customers that visit our store, we charge a $25 estimate when you drop off your camera/accessory for repair. It can take at most 14 days for us to call to you with an estimate and assessment of your repair needs. If you choose to repair the item, the $25 goes toward the repair total. If you choose to not repair the item, you can pick it up anytime, and the $25 is simply the estimate fee. Please understand that our Repair Service can be a timely process but is well worth the wait! (3-5 weeks and no guaranteed deadlines) Repair Service costs an average minimally of $100 and can be at most an average $200-$250 depending on your repair issue. If you identify with any of these issues above or other repair problems, please fill out the Repair Service form and ship your camera/lens/accessory to Gary Camera & Digital today! Repairs all require different attention and do take time, but we can very easily save you from having to buy a replacement camera or accessory. We will do our best to fix your camera/accessory as efficiently as we can for the most reasonable cost we can afford. We will always give you an honest estimate of your repair cost before we move ahead with the repair, and get your approval first. If we cannot fix an item and you want it returned, we will charge you no money for the repair and send it back to you for minimal shipping costs!